Bank of America, Van Nuys Boulevard, 1968. 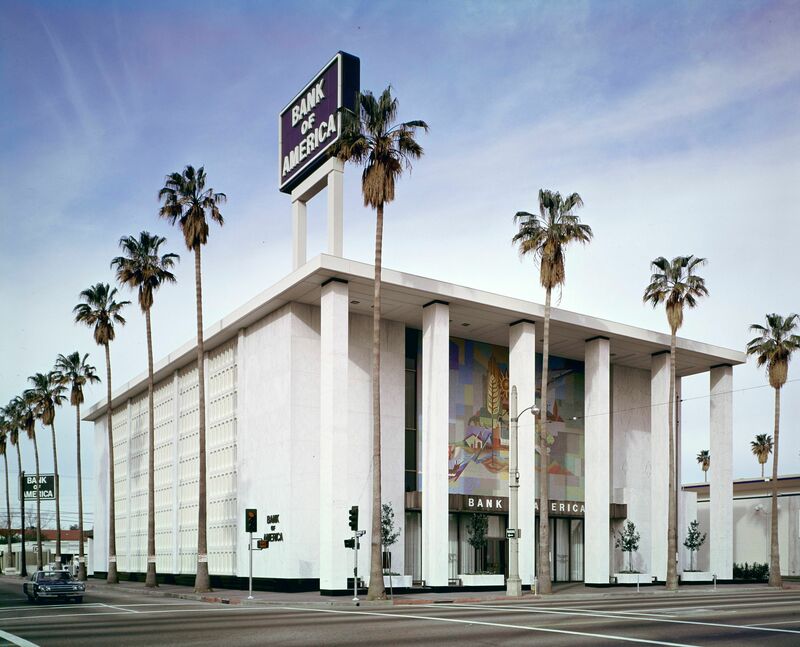 While researching online, I came across these 1968 photographs of the Van Nuys branch of Bank of America shot by Julius Shulman. © J. Paul Getty Trust. Getty Research Institute, Los Angeles (2004.R.10). 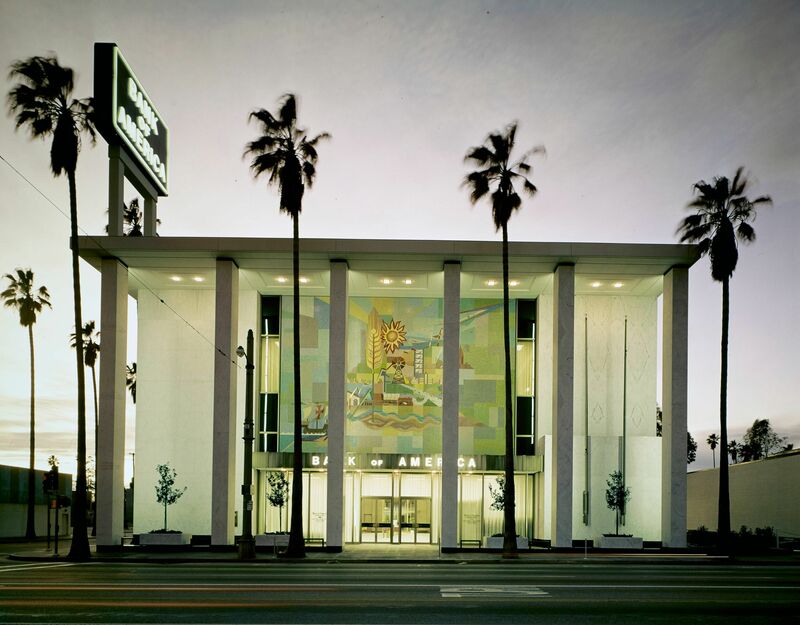 The bank at 6551 Van Nuys Boulevard still stands, still functions as a bank. But today the building is surrounded by the detritus of modern Van Nuys: garbage, homeless people, illegal vendors, trash, graffiti and the smell of urine. Oh for the banks in Van Nuys. You could practice a 40 foot putt on the carpet and never and never hit anyone. You’re SO right! Such wide open space inside then, LOL! I lived in Van Nuys from 1955 to 1962. Our neighbor on Columbus Avenue was the manager of the Van Nuys branch of BofA. My memory of the branch was that it was NOT a free standing structure, but that it was in a row of establishments in the same block as the Von’s, or maybe more south – possibly the same block as Butler Brothers. The BofA in this photo was built about 1968 , after you had lived in Van Nuys. Wow, how clean the bank and the streets look. Beautiful pictures! We were living in Van Nuys at the time these photos were taken. I was 4. Looking at that pic with the police car, what immediately came to my mind was “Adam-12” which had just started airing the year this pic was taken. Coincidentally, many of those episodes were filmed in Van Nuys. Wish Van Nuys still looked as clean as this. This B of A isn’t doing that well either. See the Millard Sheets mural over the now steel gated front door. Sheets was LA’s “society” (read non–radical) artist—the Home Savings bank-mausoleums were his commissions. See La Tapatulcheca next door–would you give it City Landmark status? They are ere thinking about it. It’s part of the “flash architecture” of the “go/go savings and loans” of the 1960’s—and its Millard Sheets art tile mural may be hidden under the paint. Also, I wouldn’t mind posting a pic of me for the community! How? Where can I post some photos here? What’s the exact website?